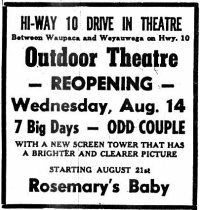 The Hi-Way 10 Drive-In was located east of Waupaca on US 10 directly across from the Waupaca Airport. The building and speaker poles are all that remain of the theater. The screen was demolished in 1997 to make way for the eastbound lanes of the new four-lane highway. The theater had closed sometime in the mid 80's. 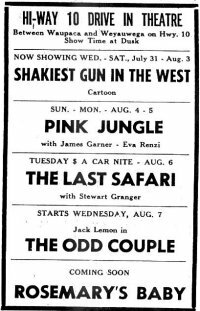 On August 6th 1968 the theater's screen was destroyed by a storm that produced high winds. The screen was re-built and re-opened on August 14th of that same year. There is a small, sad looking, hand painted sign that says "Closed" in front of the old building. 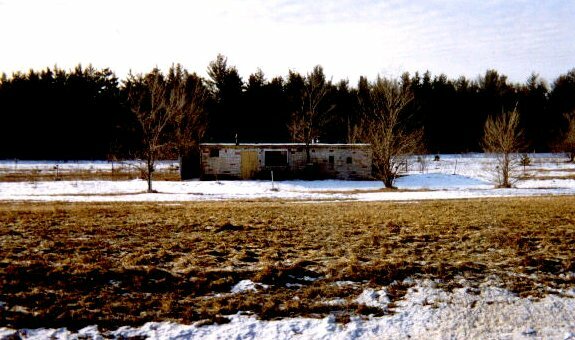 The old building stands alone by the roadside. 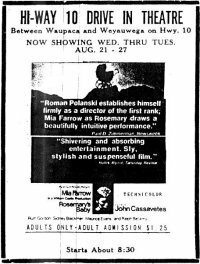 Newspaper ad from August 8th 1968 telling of the theater's being closed due to damage from a storm that leveled the screen. One week later the theater re-opened!